A rock touch on wall decoration design ! The Vitruvian man declined on a deco metal skeleton rocker. The dimensions of this metal decoration are 49 x 49 cm. The delivery is completely free in Metropolitan France and Belgium for this rocker metal deco. The work art of Leonard de Vinci revisited by Artwall and Co to give you a touch of originality while keeping a modern look. 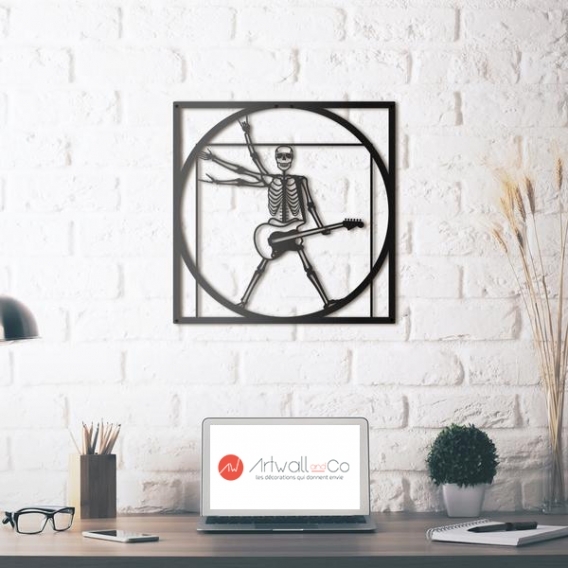 With a skeleton that will fire your home with his guitar, the Vitruvian man comes in a crazy rocker for your wall decoration. For all fans of rock and Design, this metal wall decor will fill you with happiness and will give some pep to your pieces! The installation is simplified with our installation system that will only take a few minutes. This metallic wall decoration is delivered in its protective box for a safe delivery. All our designer metal wall decorations are hand-crafted, treated and finished in black for longer life.